Want to dazzle up your web banners, social media posts and posters etc, then here I will introduce you with a five-star animation tool that will boggle up your mind. Pixteller is a stunning animation editor available with vibrant templates, exotic features all at a reasonable rate. Now, you can make any picture into a catchy animation in just a few clicks and in return, you will be surprised with a plethora of positive feedbacks and audience attention. Why is Pixteller different from other Animation Editors? 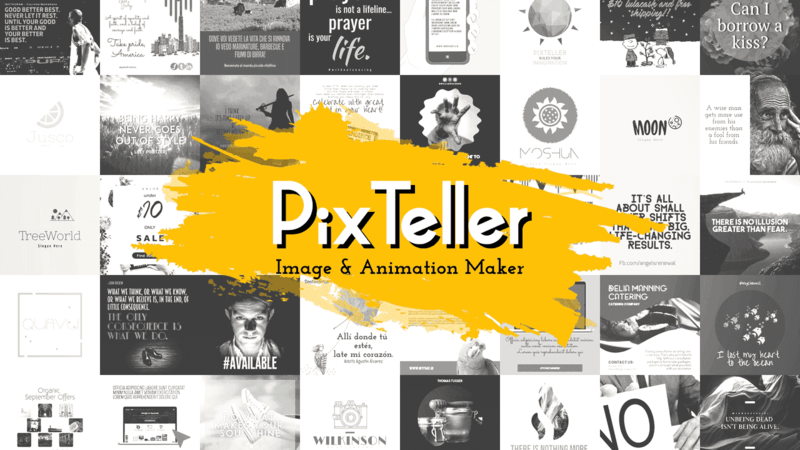 Pixteller is an all-inclusive animation and graphic editor tool with millions of images, animation templates, shapes, sizes, colours, and a lot more. Let us remove the curtains from Pixteller for getting a clear idea. Striking Templates – Give your thoughts a new creation with the Pixteller templates. Here you will find a deep pool of exciting and luxurious animation templates with designs to fall for. Each one of them is unique, and you can easily correlate it with the idea or purpose. As we all know everyone be it a start-up, blogger, individual or business houses have their own purpose of creating the banners, posters, posts and likewise. Thus, it is necessary for the editor to be the one-stop solution for all the requirements. At Pixteller you will be showered with an amazing and unending list of creative templates. Effortless to use – Are you not experienced with designing animations then don’t worry as Pixteller will help you at every step. The interface of Pixteller is designed impeccably effortless. The step is just to select the design, do the editing and then download. There is no restriction to use other images and even that here you have the liberty to modify, change or alter the images as per your wish. Thus, you don’t need to be an animation expert or a pro graphic designer to work with Pixteller’s designs. Guidance – Everything is there in the tabs itself. By this, I mean you don’t have to wander here and there with regard to the edits or how to use images, change font size, add colours, rotate text and so on. The reason being, the entire information or I can say the step by step instructions are mentioned with every element described. Trust me, I just checked out the blog topics, and tutorials listed on the website and within seconds came up with an exciting and satisfactory 4 seconds animation. It is nothing but simple drag and drop. Easy filter – Social media animations are the need of the hour as it gives an opportunity to lure the targeted audience and bring back the old customers. In addition to that that web banners, offers, covers and headers cannot be skipped. On the whole, these are the first thing that makes the eyeballs turn around. So, Pixteller has come up with a stupendous filtration of categories. Hover your mouse on the respective options and choose them accordingly. This way you will be saved from the rework and last minutes changes. Each category is as per the predetermined size. Personal space – Do whatever you want with your ideas as Pixteller will offer you with a separate interface. Reach out to the website, login in seconds and create your designs. Next time when you revisit the website, there will be no need to hunt down your previous creations or to start with a new set up. As here under “My Designs” option you will be flourished with everything. Other than this, you can also add designs under your folders with a distinctive name to avoid any confusion in the future. Browser Animation Editor – The most beloved part of Pixteller is that all the editing can be done using the browser itself. It means one can pick the design and can compare it with others on a wide screen. Further, it is a positive approach as nothing goes out of the eye. It makes the entire process of search, download and editing If you want to make an animation using your phone, then keep some patience as Pixteller might launch its own mobile application soon. Is Pixteller free or paid? After knowing the exclusive features of this editing platform, the question that comes to the mind is it free or not. You can sign up and use Pixteller for first thirty days for free and then if you really liked it or it is helping you in a good way then upgrade for the premium version with money back guarantee. Do not raise eyebrows hearing about the premium version as here you have two options. Pixteller Pro – It will cost you only 7$ per month and is accessible for unlimited images plus three animations. Pixteller Diamond – It will cost you 12$ per month and is accessible for unlimited images, videos and gifs. This animation editor is crazy, and you will surely fall in love with it just like me. Being clubbed with high-end features that are hardly available with any other animation editor is a great choice. The coolest part about Pixteller is that it is incredibly affordable. Even if you are going for the premium version, you will not be surprised with a hefty bill. The customisation and the available fonts make it even more popular. Without any second thought, Pixteller will turn out as the best animation editor for 2019 with full marks.